I got an invitation from Luwen of APartnership, an award-winning NYC based advertising agency specializing in reaching Asian American consumers. I was asked to write a blog article about my own Asian Thanksgiving recipes and represent Filipino cuisine. With Thanksgiving coming in one more week, Asian families all over the U.S. will be gathering together to celebrate what is a traditional American holiday. We’re interested in learning and helping Asian families with creating an Asian Thanksgiving. We know that some Asian American families not only prepare the turkey, mashed potatoes, and pumpkin pie, but also prepare traditional Asian cuisine, because as we all know, culture is a significant part of Asian identity here in the U.S., and brings a sense of pride and uniqueness. Thanksgiving is an American tradition and I want to keep it that way. I wish I had a bucket full of memories to share, like grandma's recipes to make during this holiday. But unfortunately, I don't. For over ten years I've lived here in the US, I could count only a few times that I have actually prepared a whole Thanksgiving spread. Luckily, American families always invite my family to partake in their tradition. And so when I accept, I always bring a dessert. Yes, dessert because as I've said I want to keep their tradition of turkey, pumpkin pie, and mashed potatoes. Well at least with dessert, I can add more variety of delicious desserts for my hosts to try. This dessert may look so simple, but believe me, each bite is delightful. After all, Thanksgiving is not about a fancy spread. It's about enjoying your time preparing food with your family; it's about being grateful for all the blessings you've received. Happy Thanksgiving! 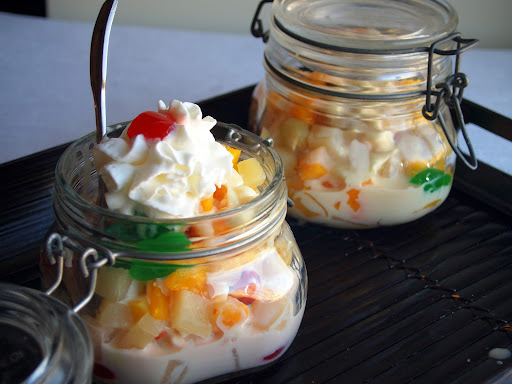 Buko Fruit Salad is an iconic dessert in every Filipino holiday. You could find this in fiestas, birthdays and holiday celebrations. I also want to bring it to the Thanksgiving table, while keeping the "American" stamp on it with the turkey and sides. Buko Salad (young coconut) dessert adds an authentic Filipino touch for a Thanksgiving celebration. Drain the fruit salad, kaong and nata de coco. Mix the condensed milk, cream and cream cheese (yep cream cheese is the key ingredient here) altogether. Toss the fruits, kaong and nata de coco. Let it chill... and voila, you're done! Oh by the way, aside from this post, APartnership has also invited me to host a 30 minutes Twitter chat on Tuesday at 3 pm EST. Follow the hashtag #asiantgiving. I hope you could join me @malou_nievera. Thanks Medeja, indeed it is! I notice that you put cream cheese? Wow that makes it interesting. I never put one before. Yep that's the ingredient that will make you love the dessert even more. Wow, what an interesting fruit salad! Super combination of ingredients and flavors. I've never seen anything quite like it - sounds wonderful. Definitely something to try. Thanks. I know how it feels to be reminded of home... but count your blessings and be grateful to have your mom with you during the holidays. The cold weather wouldn't matter to me freezing or not because I'm such a sucker when it comes to Filipino-style fruit salad like yours. I would freeze these yummers and eat them even with 20 degrees chills outside. I know I haven't been around your blog a lot, so I'm sorry and there I said it! :P But hey, I am thankful that I can always Skip to a friend and her name is Malou! Happy Thanksgiving to you and your family, Malou! God bless. I'm out shopping for last minute Thanksgiving dinner needs when this comment popped out. You know how excited I am to read it. Yep I needed to sit down and had to reply asap. Thanks Ray for dropping by...you made me realize that thanksgivivng is all about being grateful for friends like you who could make you smile. Super yum! I'd love if someone brought this to Thanksgiving. Maybe it's because I'm a mestiza but since I've been doing the whole spread the last few years, I tend to do a blended tradition between Filipino and other Asian recipes along with the traditional (ex: I do a Filipino inspired rice stuffing and a traditional cornbread one). Actually my family's Thanksgiving isn't until this Saturday and I think they would like a buko fruit salad on the table! I may have to make a special trip to the International Market to get a coconut.